Click here for audio of Episode 630. Today, a genius takes pleasure in a world of his own making. The University of Houston's College of Engineering presents this series about the machines that make our civilization run, and the people whose ingenuity created them. Here's a Gainsborough painting. It's a man in his 40s with a fine, clear-eyed face. He's someone you'd like to know. But who is he? A second -- miniature -- version of the painting finally turned up in 1973. It had his name on it. He's John Joseph Merlin, a Belgian, born in 1735. As a young man he worked in Paris as a mathematical-instrument maker. 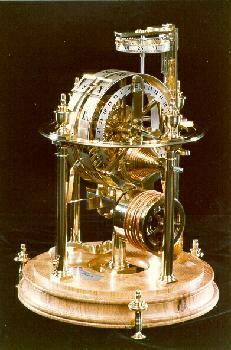 He made clocks and other fine machines. Merlin's contemporary James Watt also started in that trade. Merlin was a mechanical prodigy. The Spanish Ambassador to England knew of him. He brought him to London in 1760. Merlin was soon running with Johann Christian Bach, Thomas Gainsborough, Samuel Johnson, and Horace Walpole. This mechanic may have run in fast company. But his work makes it clear that his genius was no pretense. He produced a whole set of museum-quality clocks and watches. He built a "perpetual motion machine" that ran on atmospheric-pressure changes. He built wheelchairs and weighing machines. He invented an early roller skate. He made robots. Merlin was a harpsichordist and violinist. His musical inventions included a barrel organ and better stringed instruments. He patented a compound harpsichord. He invented a harpsichord with pianoforte action. J.C. Bach performed on his radical keyboards. One figure ... glided ... along. ... The other was [a] danseuse. ... Her eyes were full of imagination and irresistible. Merlin had touched Babbage's heart and head. Years later, Babbage managed to buy those lovely robots for himself. He liked to run them for visitors. So Merlin mirrored the imagination of the Industrial Revolution. As his personality emerges from the shadows, it reveals qualities we've seen before in the best inventive minds. His sense of humor is always present. No matter who wrote about him, they tell of the unadorned pleasure he gained by creating beauty in the world. He had a mind larger than life. And the deep joy he gained from its use was contagious. The Gentleman's Magazine was a source for much of the biographical information in the catalog. Anne French refers to an obituary in May, 1803, and an article by R.S. Kirby in July, 1803. She indicates other references to Merlin in the magazine. Hyman, A., Charles Babbage: Pioneer of the Computer . Princeton: Princeton University Press, 1982, pg. 175. Merlin worked on the so-called "perpetual motion machine" for a man named Cox. For more on this, see Episode 527.
from the National Association of Watch and Clock Collectors.